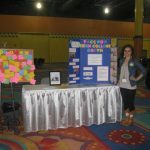 As a 21-year-old advocate for making the world safer for everyone with food allergies, I had the amazing opportunity to head up the teen and college booth at the first annual Food Allergy and Celiac Convention at Walt Disney World this past November. Anyone who knows me knows that Disney and food are two of my favorite things in the world, so I was ecstatic to be part of such a cool event! The entire day was magical, to say the least. I met so many people and learned so much, and I’m excited to share my experience with you all! My friend Sarah Norris, owner of the Gluten Free and Dairy Free at WDW blog, and Laurie Sadowski, known as the Allergy-Free Cook and author to several cookbooks, hosted the event. I stumbled upon Sarah’s blog during a Disney vacation a couple of years ago, and we bonded over our mutual love for Disney and food. 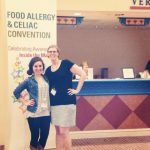 It was so cool for me to have a friend who was such a role model to me as a food allergy advocate. Last summer, I wrote a series of guest posts reviewing my Disney vacation, and she asked if I would be interested in heading up the teen and college area. Would I! I was on the elliptical when I read the email and almost fell off from the excitement! After months of anticipation, the weekend was finally here. The convention started off with a buffet breakfast that was completely Top-8-Allergen-Free! I was able to enjoy some roasted potatoes, bacon and a variety of Babycakes pastries before heading over to the event. Yum! 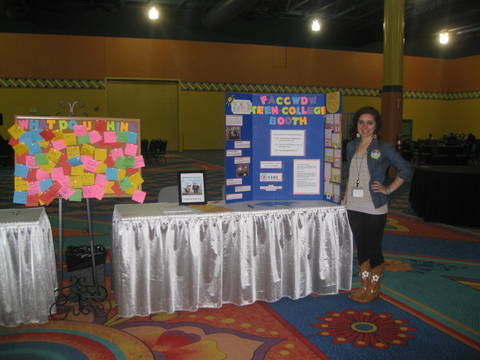 My booth consisted of a tri-fold that contained information about allergy-friendly options available to teens and on different college campuses around the country. My favorite part, though, was the interactive bulletin board that I created. I had a bunch of different questions with color-coded sticky notes that people could answer and pin to the board. That attracted a lot of children, which was so cute. They just couldn’t wait to help out! I love little kids so it was fun for me to meet them and connect with them over our similar allergies. There weren’t very many teenagers, but I was able to talk to many parents and give them advice, which was very rewarding. Several people came up to ask me about what I’m doing at NC State, and if I had any advice for their relatives who were about to go to college. That, to me, was the best part of the convention: knowing that I was helping others in a big way. So who did I meet? As you can imagine, there were a ton of vendors and speakers at the convention. This being my first convention, I was excited to meet other professionals in the field and learn about the career options I could pursue. I was, of course, super excited to finally meet Sarah and Laurie in person. After months of email correspondence, we recognized each other and it felt just like reuniting with an old friend! I was also able to meet several big names in the allergy-friendly world. My mom listened to Disney’s Special Diets Chef, Gary Jones, speak about his experience cooking for visitors with dietary restrictions, and brought me over to meet him afterwards. As an avid Disney geek and lover of pretty much every restaurant we’ve tried at the parks, I was absolutely start struck when I met him. What an experience! I was also able to meet the Chief Marketing Officer of Enjoy Life Foods, Joel Warady, and his team – another star struck moment! Enjoy Life was the first brand I found when I had to alter my diet, and the fact that I was meeting one of the people who was instrumental in the company’s success was amazing. Everyone was so friendly! I was also able to meet some of the other vendors, which was really fun. My new friend Angela, from Saffron Road, and I bonded over our interest in holistic nutrition and Babycakes donuts. I was able to talk to Jen from the Gluten and Grain Free Gourmet about her business and her delicious grain-free cookies. I also met Erica, from Celiac and the Beast, which was fantastic! She gave me a copy of her book and I read it on the drive home. If you haven’t already, I strongly suggest you check out her blog and her book. This whole experience was so rewarding in many ways. Obviously, I learned a lot about the growing need for food allergy awareness and the different career options in nutrition, but the significant takeaways were so much more than that. I cannot stress enough the importance of finding a community of peers with food allergies – it was so nice to be able to talk to people who understood what makes me different, and share advice about what to do or what to cook. I was so in my element at the convention because pretty much everyone there was a lot like me! My mom laughed when we sat down at dinner with a bunch of people from the convention who all pulled out their phones to photograph their dinner, just like I do. I found my people! This was also a great learning experience for me personally. I’ve never had this kind of responsibility before, so it was a big deal for me to step up and take charge of such a big task. After collaborating with Sarah and Laurie, creating my entire booth’s display, and talking to everyone at the convention, I feel a lot more confident in my abilities and in the direction I want my future to take, and that’s a big deal to me! So what do you think? Let us know your thoughts in the comment section. If you are interested in becoming a guest blogger, please do not hesitate to reach out. 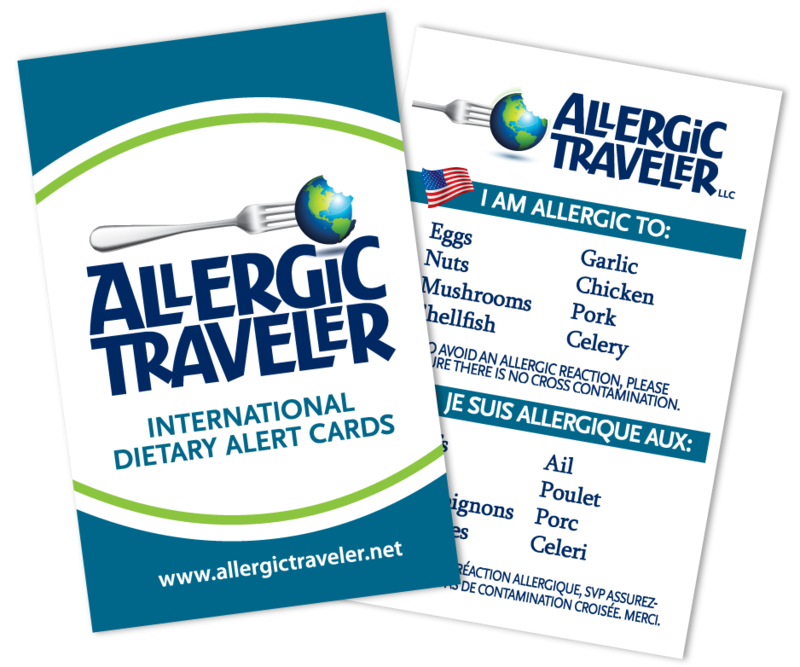 My email is Tarah@allergictraveler.net We would love to have you!